Size of this preview: 500 × 599 pixels. Other resolutions: 200 × 240 pixels | 629 × 754 pixels. 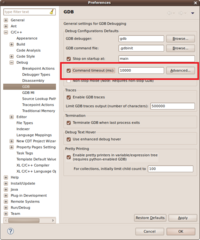 Preferences page for GDB command timeout. current 18:05, 17 April 2012 629 × 754 (121 KB) Mikhailkhod.googlemail.com (Talk | contribs) Preferences page for GDB command timeout. This page was last modified 18:05, 17 April 2012 by Mikhail Khodjaiants.